While we Indian love the real thing, the fiery Tandoori chicken on bone, But for the west it's the Chicken tikka. Often made with boneless breast pieces with a milder marination and added food colour to compensate for the fiery red chilli hue. It definitely is easier to eat that way with a fork and spoon or simmered in a fiery looking yet mild velvety butter masala gravy, mopping up the makhani masala with soft naans. 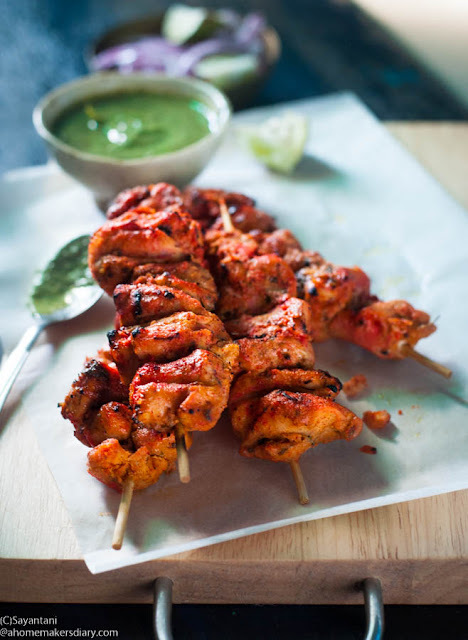 Whichever way you prepare or serve it...the fact is you just cannot escape having a good chicken tikka recipe in your repertoire. The best part though is you can marinate any veggies, baby potatoes or Paneer to make vegetarian version of tikka. 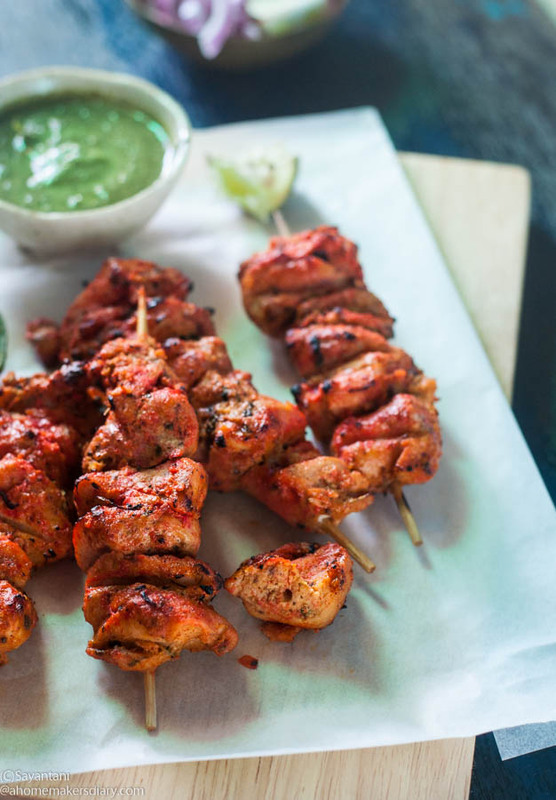 with little planning, It hardly takes any time to cook and is perfect for a big party where with the marinated pieces in the fridge you can grill them on the go. Kebab skewers or bamboo sticks. Wash and drain the breast pieces. Dry them with kitchen towel and cut in 1" cubes. Make a paste or grate the onion and squeeze out the juice. Marinate the chicken with onion juice, half of a lemon juice and little chili powder. Keep aside for 30 minutes. Soak the bamboo skewers in water at least for an hour. In the mean time dry roast all the spices one by one listed under to roast and grind. Just roast on a medium flame for 30-60 seconds just to bring out the natural flavour. Grind them to get a semi coarse powder. Dry roast the besan on low till it's a few shade darker and a nutty toasty aroma comes out. Keep stirring it to roast evenly. Take out. In a big bowl mix the hung curd (use homemade or fresh ones from the shop which is not very tart), besan, kebab powder, Mustard oil, salt, kashmiri chili powder, salt, turmeric powder and ginger garlic paste. Mix properly and then add the chicken pieces in and coat them well in marinade. Cover and keep in fridge for at least 4 hours. Over night is best but in that case do not add the salt. Add salt an hour before you plan to grill. Once you are ready to grill, keep your ghee melted. Skewer the chicken cubes in the stick and keep aside. You can cook the tikkas in 3 ways. In the oven, on stove top or in a microwave oven in grill mode. Pre heat oven at 200C. Use the wire rack to place the skewers and place a big tray lined with aluminium foil underneath to catch all the drips. Bake for 10 minutes. Then baste with ghee and flip the skewers. Bake again for 10 minutes. To get the charred marks either broil them for 3-4 minutes or directly hold them on your stove burner on high for a minute or so. Place the skewers on microwave wire rack. Grill for 7 minutes. Baste with ghee and then again grill for 5-7 minutes or till they are done. To get the charred effect cook them on combi mode (Grill and convection) for 5 minutes or directly hold them on your stove burner on high for a minute or so. You can either cook on a grill pan or a heavy botton iron tawa. Heat the pan first then brush some oil on top. Place the skewers on it and cook on medium flame for 5-7 minutes. baste, flip and cook till done. baste 2-3 times to stop it from drying out. 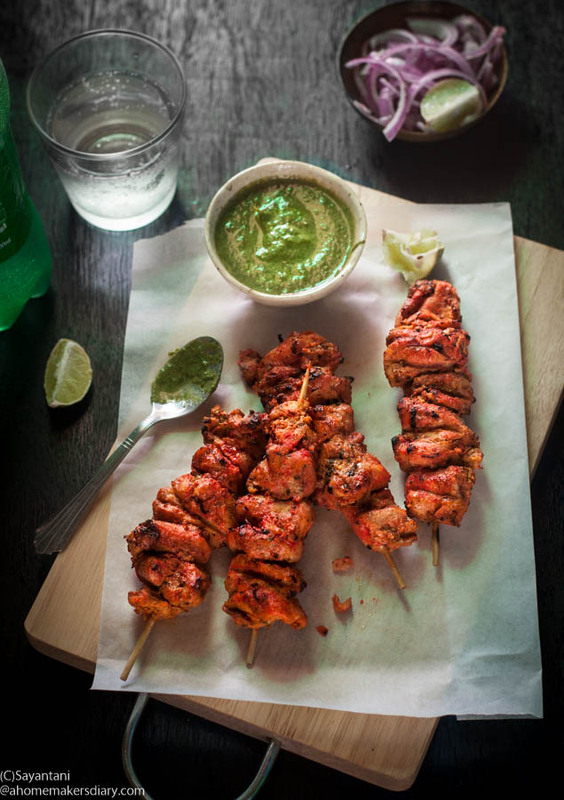 Serve hot with Green chutney and onion rings. I use homemade curd (full fat) and hang it in a kitchen towel for an hour. You can also use Greek yogurt if you have access to it. Thank u Mam for this wonderful detailed recipe. Ur detailed explanation makes d recipe so easy.